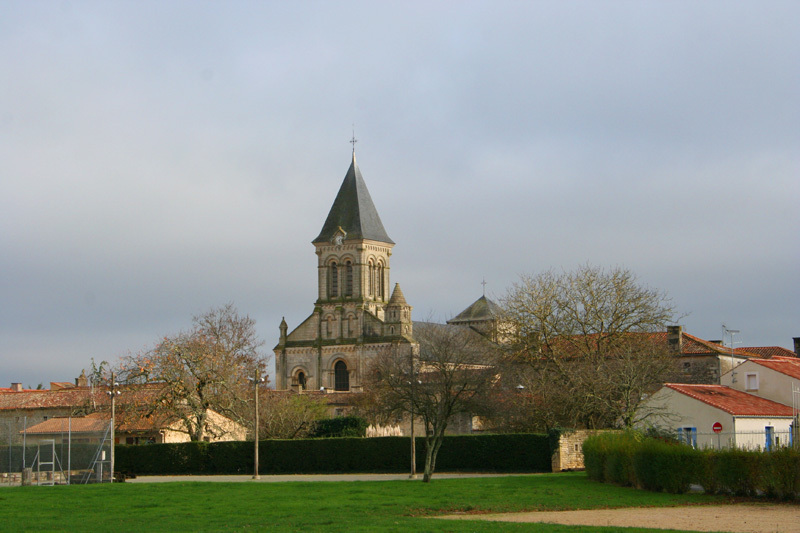 This very attractive village just 12 kilometers from Fontenay-le-Comte in the south of the Vendee is where Alienor d'Aquitaine was born in her fathers castle in 1122, her mother Aenor de Chatellerault is buried in the Royal Abbeye St.Vincent. When Alienor became Queen of France by her first marriage to LoiuisV11 she granted the abbey royal status.She later became Queen of England by her marriage to Henry Plantagenet. 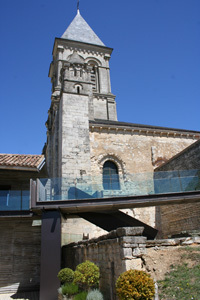 The abbay was built in 1068 by Ayraud Gasedenier the Seigneur of Vouvant and during the 13th century the Augustinian monks from the abbey along with those from; St.Michel-enl'Herm, Maillezais, Absie and St.Maixent in digging the five abbeys Canal, which with continuous digging over several centuries drained the Marais Poitevin to produce the fertile productive lands of today. The abbey was burnt down by the Huguenots in 1568 and this saw a decline in its prosperity. 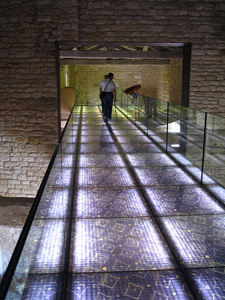 It was listed as an historic monument in 1862 and restored. St Vincent's abbey is the finest example of Romanesque and is the best preserved in western France, it contains a 3 elements the church, the cloisters and the monastic building almost virtually intact. The Romanesque Cloisters with its 4 galleries is the only one in western France to survive intact and the pointed arches upon heavy scalloped capitals supports the groined vaultings. The cloisters links the church to the charter house. In the 17th century the vaultings of the charter house were rebuilt in the Romanesque style. The front portal of the church has many stone carvings portraying the 7 deadly sins, geometric motifs and animal masks which are surmounted by interlacing and palmettes. The triple nave with its 7 barrel vaulted bays borne on transverse arches rests on twin columns, the lateral arches are supported on single columns. There is a discovery trail centered around monastic life; touch books and state of the art museum technology. Events: L'Art en Gouter: concert and talks with refreshments. 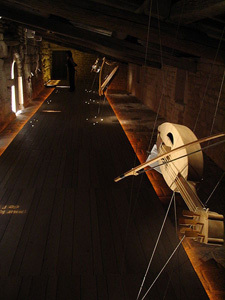 Les Jeudis de St. Jacque: every Thursday (july-Aug) a voyage through history with music. Tours in period costume for children 5-9. Nieul Village de Lumiere: open evenings 4-8th August 2009. Maison de la Meunerie 16 Rue du Moulin. Tel. 02 51 52 47 43. In the restored watermill which was built in 1728 you will discover the life and workings of a miller. This working watermill was returned to active use by a local association in 1997 and today produces about 60 tons of flour a year for the local boulangeries, this includes flour for the old farmhouse breads, buckwheat flour for pancakes and organic flour. You can view the large oak paddle wheel as it revolves to the flow of the mill stream and all the workings and gears that turn the mill stones. The two rooms of the millers house are furnished as they would have been in the 19th century. There is also a work shop of the clog maker. A bread oven and two stone Ponnes for laundry. Open 15th June to 15th Sept everday 13h to 19h Closed Saturdays. Fete de la Meunerie. Sunday and Monday of Penticoste (first Monday in June) open from 10.00 cost 6.5€ a great day of entertainment and displays including lace making wheel wrights, basket making bread making and a lot more. Le Champ Durand. This Neolithic site on the Oulmes road just south of the village was discovered in 1971 from aerial photographs and dates from 2400Bc. It consists of 3 concentric rings of ditches and banks upto 2.5m deep 2 kilometers in length, one of the entrances was gated and had a drystone tower, the other entrances had carved banks. There is little sign of habitation and was thought to be primarily a meeting place, graveyard and market as well as defensive. Restaurants;Auberge du Cloitres 6,rue Pierre Brisson. Tel. 02 51 52 46 66. Taxis; Taxis de l'Altizia. 7, rue dd Cenan Sauvere. Tel. 02 51 52 49 54. Taxis Xantonnais. 86, La Tobac, Xanton Chassenon. Tel.02 51 52 27 82.